Known for it’s world famous Ati-Atihan Festival that is annually held every January. Kalibo also has other tourist attractions that you can explore within a day. And during my stay, that what I decided to do. I came up with lists of places that I could explore in one day before I went to Boracay where most of my holidays will be spent. My hotel of choice in Kalibo is the Agzam Resort and Spa . A beautiful garden resort within your budget that offers amazing food and lovely swimming pool. This is where I started my tour around Kalibo. Built in the 1800s, the church has been rebuilt due to the earthquake that hit the province a long time ago. Many devotees visit this church and people regularly visit and offer prayers. The moment you enter, you can already feel the solemness of this church and how important this church is for the lives of Aklanon. Right across from Kalibo Cathedral, you will find Pastrana Park where you see people sitting , relax and just enjoying the day. The park is very clean and you will find a children’s playground and monuments that are well kept and protected. I actually bought a coffee in one of the fast food places next to the park and drank it here under the shade while observing how laid back the people here are. It’s quite relaxing! A few meters walk from the park and Kalibo Cathedral, you will find the Museo it Akean. With a minimal entrance fee, you will find different interesting artifacts that speak of the rich and cultural heritage of the people of Aklan. It is definitely worth visiting! Another historical site to visit is this memorial to commemorate the 19 martyrs of Aklan who sacrificed their lives defending their home from the colonizers. Few kilometers out of the city, you will find a piece of paradise and that is the Bakhawan Eco-Park. 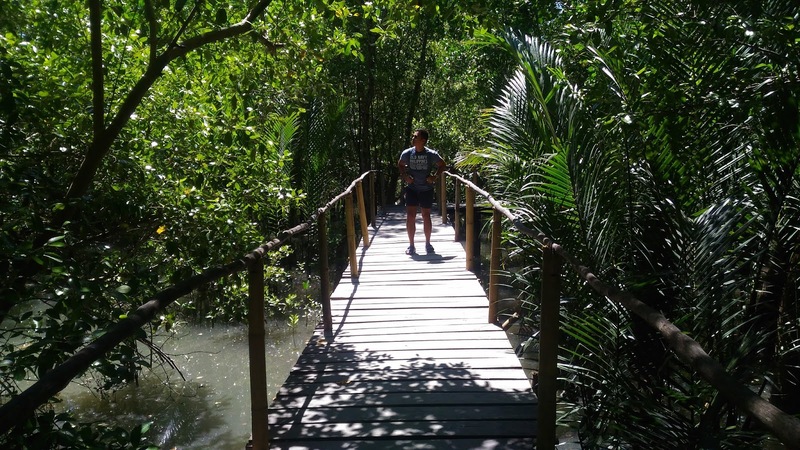 This mangrove forest stretches for miles and for an entrance fee of Php 150.00, you can enjoy walking along the mangroves that stretches over a kilometer. This is one of the most stunning mangrove forests you will find in the Philippines! When I asked some of the locals where the best place to eat lunch was, they pointed out to Lorraine’s Tapsi. Pity the main restaurant is closed because it was reserved for an event, so we went to another branch in the city and orderedfor Tapsi Php 75.00 and Ghanglan Noodles for Php 70.00 . Aside from the delicious taste of the food I found it pretty affordable as well. Such a charming and quaint little town. I remember my hometown in Leyte with this place. Nice to find your blog!